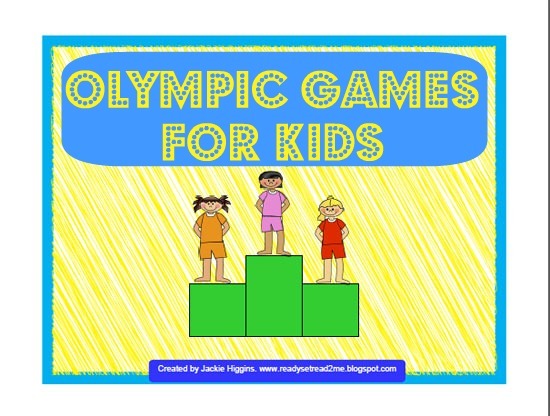 With the Olympic games starting soon, this could be a wonderful time to host a home or classroom Olympic games for kids! The Olympic games would be a great back to school math activity. When I was teaching, I had two measurement activities that my students loved. The first one was called Metric Me. The other one was the Measurement Olympics. I have created two Olympic themed activities from these two fun activities. The first activity that my students loved was Metric Me. 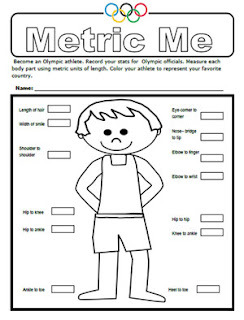 Metric Me is a measurement activity where students measure their body parts (in metric units of course) and record the measurements. The cool thing about this activity is that came from a curriculum that my dad helped to write when I was in elementary school. My dad is a retired high school science teacher. When I was a kid he worked with a group on a project to write science curriculum for elementary aged kids. Guess who tested his activities? And I enjoyed them so much that I later incorporated them into my own classroom. The other awesome thing about this activity is that my dad's former student, Brittany Borman, is an olympian. One of our hometown girls will be competing with the USA Javelin team in London! Brittany's mom was a principal too and I had the priviledge of working under her. I'm sure Brittany is thankful that Mr. Bradley taught her the metric system way back in high school! Since I'm so excited about the Olympics and getting kids excited about learning through the Olympics, I'm offering Metric Me as a FREE download! (click on the picture of Metric Me above to get to the free download). The second measurement activity that my students loved was the measurement olympics. 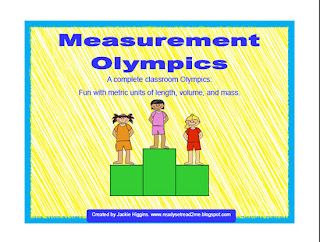 These olympic games for kids also teach kids to use measurement in a hands on way. There are five games that all use a variety of measurement skills in these math olympics. One game is "torch relay". 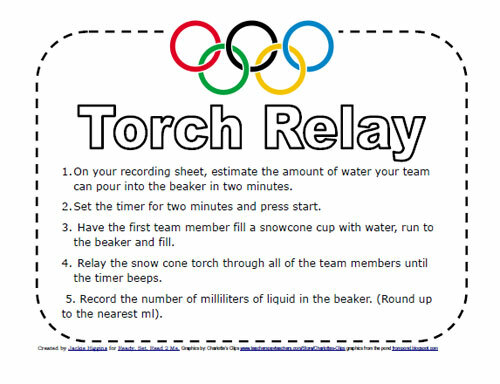 In torch relay, The students relay a snowcone cup (olympic torch) of water to a beaker. After 2 minutes, the students measure how much water they have collected. The measurement olympics also requires students to make estimates before competing, and to find the difference between the estimate and the actual measurement. 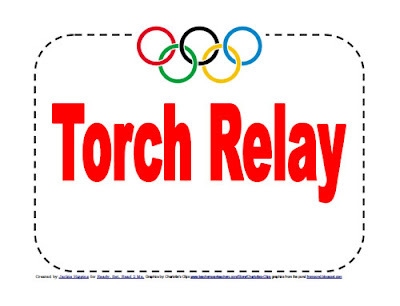 You can purchase a complete classroom olympics kit in my teachers pay teachers store for only $3. The kit includes a teacher's guide, descriptions of each event, alignment to the common core curriculum, a supply list for each event, printable signs for each event, printable student directions to post for each event, recording sheets for students, printable gold, silver, and bronze medals, and a certificate of completion for each student. This would be a fun back to school math activity. This activity would probably be best for 3-5 grade classrooms. Are you incorporating the olympics into any of your back to school preparations at home or school? Your Olympic products look great! I downloaded your freebie. Thank you! Also, I sent you an email about your Olympic products. Please, check it out. Thanks! My kids always need more measuring practice. Thanks for sharing. I love your "Metric Me" worksheet - thanks for the free download! Very neat ideas - how fantastic that you know an Olympian. I hope she does well in London!